With the Farm-to-Fork Festival happening this weekend, everybody's got food on the brain. Here's a way to grow your own without all of that pesky weeding. John Bartell hit the backroads of Marysville and met the Mushroom Man. MARYSVILLE, Calif. — If you are viewing on the ABC10 app, tap here for multimedia. The mountain of compost is dark brown, and hot enough in the middle that it's steaming, even during a warm summer day in Marysville. For the folks at Mushroom Adventures, the smelly mound is invaluable. "This is our black gold... our mushroom compost," said owner Donald Simoni. Basically, it's a heap of primo mushroom food. "It's thermal biology... it's the microbes," Simoni said about the heat. The compost is a living organism that can generate heat upwards of 150 degrees. Getting the compost just right isn't the only challenge. Farming on the scale of Mushroom Adventures also requires just the right amount of humidity and a climate controlled room. Inside of Simoni's facility, it's like an alien world and the earthy aroma is hard to ignore. Mushrooms of all shapes and sizes fill the dark, steamy building. Portobellos, shiitakes, and white button mushrooms are everywhere you look. 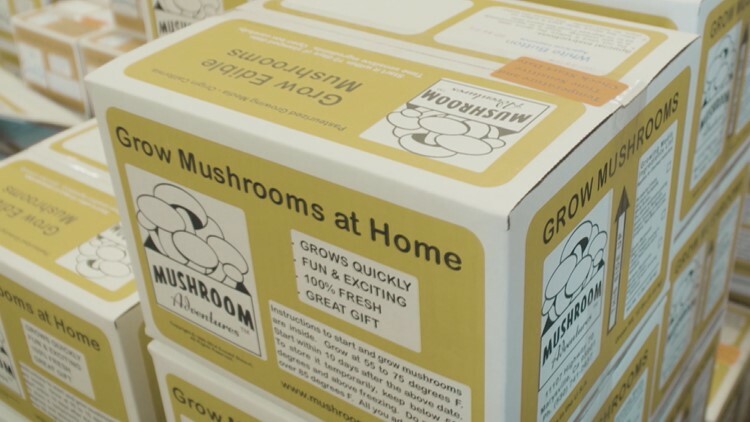 Donald and his crew grow mushrooms to sell at farmers markets, but they also sell boxes containing everything mushroom lovers need to grow their own at home. Growing mushrooms is a complex proposition, but that’s the beauty of his kits. He's taken care of the hard part. Ready to try farming? Maybe start small with a mushroom patch. "We put that little bit of mycelium in here, and everywhere it makes a connection from the top to the bottom," Simoni said. "That is where a mushroom comes up." In simpler terms, you get a box from Mushroom Adventures, then keep the soil wet. You should be seeing mushrooms in seven days. Generally, it takes five weeks for mushrooms to mature. That process is where Simoni got the name for his business. "The adventure is watching them grow from a box of dirt or sawdust and turning into a consumable," Simoni said. Continue the conversation with John on Facebook.